This page contains a variety of ideas and strategies for events using your Spiral Wishing Well as a focal point that motivates people to donate large amounts of money beyond just coins from their pockets or purses. A church raised $40,979 in one day! A school raised $248,000 in 45 days! A small church school raised $7,352 in one day! A charity raised $1,200 in a weekend at a mall! A little-known blind service organization raised $10 million over 6 years! Some of the ideas below can also be used for "attended" placements that depend on coins from people walking by at a store or restaurant or other retail-type of setting. Some of the sections will overlap with others, but that is because we are trying to toss out a variety of ideas that allow you to adapt the best option, or combination of promotions to your particular situation. If you are conducting an event and don't pre-promote the Well, you probably won't generate any more money than a passive location where income is based on 1) Getting people to stop, and 2) They need to have coins in their pockets or purses. The benefits of a retail location such as a store or restaurant is that it generates a relatively small amount day after day after day. But an event is only a few hours or a weekend, which allows you to promote the Well. A pre-promoted Well-strategy ensures people come with coins they have gathered from home, and that they will purposefully seek out the Well. With a little planning and some effective strategy, you can dramatically increase the total income at your event. The following suggestions include the most effective techniques gathered from many successful events over the years. Advance Notice: Send out advance notice encouraging people to bring all the coins from home…including the coins collecting in jars, on dressers, in laundry rooms, and under cushions (children love the adventure of hunting for coins). The average American home has over $50 worth of coins, and most of that is usually on Dad's dresser! 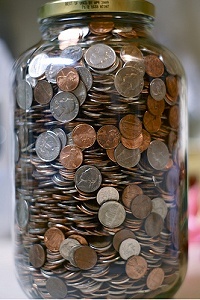 Men don't like to carry coins, so we toss them in a jar or other container where they add up to a lot of value over time. Many homes have much more than $50. All they need is a little encouragement to donate it! Many people have been collecting coins with the plan that "someday" they will cash it in. Encourage them to bring it to the event and donate it...and save all the hassle of counting and wrapping it!!! Priming: Have someone available to “prime” the Well by dropping in quarters whenever there is a lull in the action. Demonstrating quarters will promote quarters. But don’t make the mistake of handing coins to the kids. Let their parents do that! Matching Pledges: Line up one or more people who will match however much is raised during the event. This is often done in the form of an amount "up to a maximum limit". At the church that raised over $40,000 in one day, there were two members who matched up to $10,000 each! This is often easier than it sounds. If there are any donors who are planning to donate a large amount to your project, ask them to do it in the form of a matching amount of money raised with the Wishing Wells. Then you can use that matching amount to get another one or two people to do matching amounts....and to get everyone else to bring all their change from home with something like, "We have someone who will match however much we raise with the Spiral Wishing Well...so be sure to bring all the change you have been collecting at home all these years so we can double it with the matching pledge!" Or "triple it" if you have two matching pledges...etc. 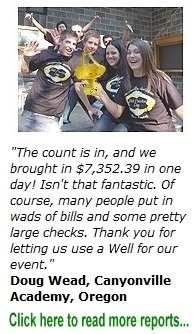 Try to Break the Record: Promote the event as an effort to break the income record for Spiral Wishing Wells. The current one-day record is $40,979 at a church (click here to see how they did it). You might not break that record, but if you try, it will create excitement and yield better results. For purposes of the "record" we define it as, "the total amount of coins, bills, checks, pledges, matching amounts, Mini-Well toy revenue (see "Free Mini-Wells" below), and all other amounts collected over the period of your event." In other words, it isn't just the amount of coins that are spun around the coin funnel. It is EVERYTHING you generate using the Wishing Well as a focal point to get people to donate more than they would otherwise bring with them. Announcements: Every few minutes during the event, the person with the microphone should remind people to have fun tossing coins into the Spiral Wishing Well. Skill: Encourage the “Test Your Skill” game of tossing in coins without using the ramps. A “demonstrator” person can show people how to do it, and then they will experiment with their own coins. Cup of coins for a dollar: Offer a couple dollars worth of coins for a $1 donation. In other words, scoop out a cup of coins from inside the Well in exchange for a $1 bill dropped into the Well. You just keep recycling the coins while adding dollar bills to the total. We’ve done this at events where we have brought in up to $300 worth of bills in one hour. CAUTION: Do not dump coins into the launch ramps. They are designed to handle 2 or 3 coins at a time. If they get jammed, have a short piece of stiff wire that you can stick up under the slot to dislodge them. Free Mini-Wells: Give away mini-well Vortx® toy banks for a “$25 to $50 donation”. People are having fun watching coins in the large Well, and it is a perfect time to offer the toy. As a piggy bank, it encourages saving money, and makes a great birthday or Christmas gift. But it also demonstrates science and makes a great show-and-tell item for school incorporating the information in our Student Guide. They retail for $25 plus about $15 shipping from the our website, so offering them for a “$25 to $50 donation” is a great deal for those attending your event. You can buy them for wholesale cost, so you can multiply your event income dramatically with this option. Click here to read more about this extraordinary bonus income. 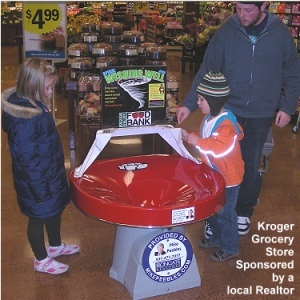 Toy Demo: If you offer the toy banks, be sure to have a couple children “demonstrating” the toys on a table, especially the “coin limbo” game and high-speed spinning. Let other kids try it. They will quickly engage with the challenge and want to take one home with them. For more information about the toys and games and to see the Coin Limbo YouTube video, click on www.spiralwishingwells.com/toy. Prizes: Get some prizes donated for “whoever brings the most coins” or "whoever brings $50 or more worth of coins." One group got a local company to put up a bicycle as a prize. Another provided a television set. Obviously, if you get those kinds of prizes, you will promote them ahead of time and motivate people to bring even more money. The challenge with this kind of promotion is the ability to count the coins. There are some inexpensive coin counters available. Search the Internet for "coin counter" or "coin sorter" or get a bank or credit union to provide a coin counter and give them program recognition for their role. Competition: Use competition any time you can. If your event has some natural divisions such as classes (freshman, sophomores, etc.) or other ways that can provide competition between groups, use that as part of your promotion. We all know that competition can motivate people to do far more than normal. Photos: Take lots of photos of your event. But also take a staged photo similar to the one shown here, with your staff and as many as possible gathered around the Well, as if at a "grand opening" event. If you also have toys, have several of the adults or children holding the toys, and the others applauding. White gloves are optional! If the camera angle is a little above the floor (such as from a ladder, balcony, or a flight of stairs) then it will show more of the funnel, and accommodate more people around it. Pictures like this make great press releases for the local media, and I would love to put it on our website and promote your organization and event that way. So be sure to send us your photos. Summary: The above are basic promotional event strategies. For other examples of what people have done at promoted events with great success, including how the current one-day record was set, please continue reading this page. Adding a change machine close by is one of the best ways to dramatically increase Wishing Well income. Men don't like to carry loose change, and women quickly empty their purses. But they will continue to put dollar bills into a change machine to provide coins for their children or grandchildren to toss into the Well. The following paragraphs expand on the above suggestions, and offer some larger contest ideas, and suggestions for store placements. Tape a dollar or a color copy of one inside the sign frame with the words, "Thank you for dollars too!" such as the one shown here. It is amazing how that simple visual stimuli will increase your income. As your cashiers hand people their change, have them cheerfully suggest, "Be sure to have some fun with the Spiral Wishing Well on your way out..." as they point to it. Some stores are even more aggressive than that. When they give people change, they do it with a lot of coins, accompanied with that same suggestion to have fun at the Well. In other words, if someone is getting $1.50 back, they don't hand them a dollar bill and two quarters, they hand them 4 quarters, 3 dimes, and 4 nickels, or something like that. Hoody Secton, a 7-11 franchise owner, did that very thing with his customers...many of whom are daily repeat customers. In a sense, he "trained" them to toss in all the loose change he and his cashier's handed them. He sent in this report: "For the last eleven years, out of 8,000 Seven-Eleven Stores, I have been in the top five raising money for the Jerry Lewis Telethon. My Spiral Wishing Well is my number one fund raiser . . . at over $16 per day, almost $500 per month. We average about 2,000 customers a day and most of them come in regularly. Interestingly, those same people toss coins in day after day---even if it's only a few cents change from a cup of coffee, sometimes right down the middle of the funnel and they don't even watch it spiral. They just do it out of habit." We would love to publish your organization with a new one-day record. This section will explain how to do it. But even if you can't break the record, attempting to do so will result in the largest possible amounts. So it becomes a very productive goal around which to motivate your event attendees. We have several categories for records...schools, churches, stadiums, and other events. 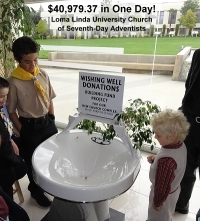 The current overall record is $40,979 at a church in Loma Linda California. Click here to read about their exciting success. Canyonville Academy in Oregon raised $7,352 on an alumni day when they were raising money for a grand piano. They came right out and said, "Let's try to set the one day record for the Spiral Wishing Well by passing all the coins, bills, checks, and pledges through the Well." Records are not set at retail locations from walk-by traffic. Even if you placed a Seven-Footer in a 50,000 seat coliseum, it would be difficult to set a record from walk by traffic who might not even see it. However, if someone at a microphone said, "Be sure to stop by the Spiral Wishing Well at the entrance and empty your pockets..." then you could easily set a record with a large crowd. Applying as many of the suggestions in the green box above as possible will generate a lot of revenue. The most likely setting for record income will be at an event where you are raising money for a cause or project and you encourage people to pass their bills and checks through the Well too. And if you get one or more companies and individuasl to "match" the amount raised, you can double and triple the amount! Records are set when Wells are used as a "focal point" for the event. It is amazing how people will step up and make some very large donations when a unique challenge is the focus, especially when it is positioned as an attempt to set a new record. To maximize your kick-off income, be sure and do as many of the promotional ideas on this page as possible. Remember, ALL THE MONEY AND PLEDGES THAT ARE PASSED THROUGH THE WELL COUNT! So if someone has pledged $20, or $50, or $2,000 or $10,000 or a $50,000 donation to your event, don't just accept it. Use it as a matching grant at an event with your Well. Use it to get a lot of other people to donate $5, $10, $100 or more. Promote your event as an assault on the record. Encourage people to search for and bring all the coins from their home. Give away the toy mini-Wells FREE for a $25 to $50 donation or whatever amount you set. At the end of the event or day, consider EVERYTHING that has been donated as part of your Well's income! We would love to publish your event results. Just let us know! Offer something in exchange for a quarter or dollar tossed into the Well. For instance, the American Heart Association placed a Well in a shopping mall for a weekend, right next to a cookie store. They arranged with the cookie store to give away a small cookie in the shape of a heart to anyone who tossed in a quarter. The charity raised $1400 worth of coins over the weekend and the cookie store had record sales because "nobody can eat just one!" This same concept has been done many times with other giveaways such as small ice cream cones, a Pepsi or Coke. You can also line up some prizes such as bicycles, cameras, televisions, or other popular items that are provided by local stores. 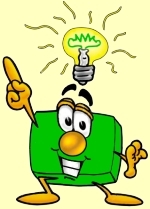 Then run a promotion such as, "Toss in a quarter (or dollar) and enter a contest to win a free television." Have everyone fill out a little entry blank and toss it into the Well or into a box. Then have a drawing for the winner at the end of the event. 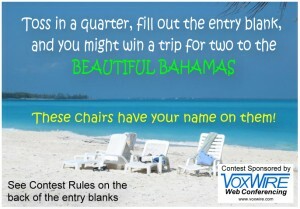 Additional revenue can be generated by getting a company to sponsor the contest. They will get their name on the entry blanks along with a tear-off coupon or something similar. Depending on the size of your event, that sponsorship alone can generate another $1,000 or more. Some of the most successful events have been promoted on local radio (sometimes with a remote on-site broadcast) that encourage people to gather up all the coins in their house and go have some fun and win a prize at the same time. If you have several stores or locations, you can benefit from a big contest. A 100-store regional chain gave away a free trip to the Bahamas at the end of a 6-month campaign using the "toss in a quarter and win a trip" entry blank concept. Since quarters are worth 25 times as much as pennies, they increased their coin-revenue dramatically and drew a lot of attention to their charity. They also instructed their cashiers to make change with a lot of coins and to cheerfully suggest to the customers to "...have some fun with the Spiral Wishing Well and be sure to enter the Bahamas trip contest on the way out." Stores love it because they can't afford to conduct a contest like this on their own. As a bonus, the sponsor received the entry blanks every week, and sent "thank you" notes to the contestants, along with a special offer to get a free month of service. This is a GOLD MINE for a sponsor. So it is fantastic for everyone. 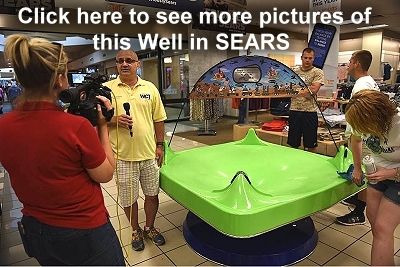 The charity raises LOTS more money, the stores love it, and the sponsor gets great exposure and a valuable call-to-action device. We have developed a dedicated section for church programs. There are some things a church can do to raise large amounts of money and get fantastic community exposure that no other organization can do. Click here to review that program. 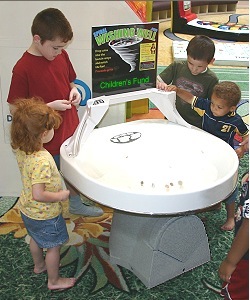 Spiral Wishing Wells can raise a lot of money when placed in schools, especially if you use our event strategies. School Funnels can also be placed in area stores and restaurants where the owners and managers like to support the school which is a good customer-demographic for them. 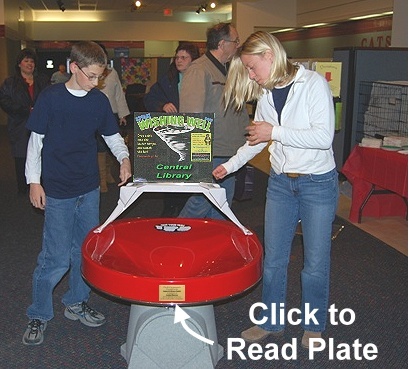 Click here to read more about school programs. 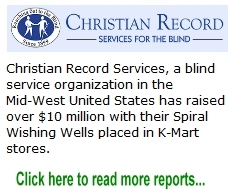 A little known organization in Lincoln Nebraska by the name of "Christian Record Services" started with three Wells and kept reinvesting the income in more and more Wells until they had over 300 Wells in Lincoln and in stores up and down the Mid-West raising money to send blind children to summer camp. They branded their campaign, "Wells of Hope." 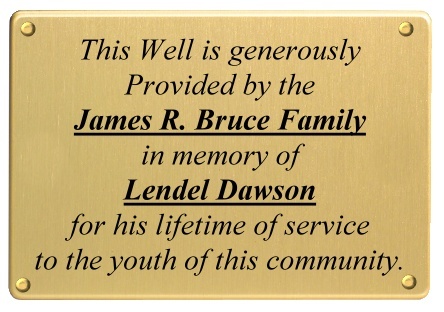 They raised over $10 million in 6 years and nearly EVERYONE in that region learned who they were. While the $10 million was fantastic, the exposure and long-term impact has also been a great benefit and has made a huge difference in their direct fund raising. Christian Record Services became one of the best-known, most active organizations in their region because they placed enough Wells that almost everyone in the entire area saw their signs above the Wells several times a week. The media featured stories about them a number of times, and people have learned about their service to the blind which has attracted other donors and volunteers. If you want that kind of exposure for your organization or project, it can start with just a couple of Wells. A school used the theme, "Coins for Kids". Another used, "Coins for Change". A church raising money for global missions added this to their sign: "Supporting missions 'round and 'round and 'round the world!" We think that is a very clever reference to the spinning coins. Use your imagination to match your campaign, and let us know what you come up with. If you come up with a promotional or event idea that works, please share it with us along with pictures, and we will gladly add it to these best-practices page!